This installment of our “Five Questions” series features inquiries about light painting headlights, tripods, open hours for national parks, moonrises at sunset and lens choices for aurora. Pickup in Nelson Ghost Town, Nevada. © Tim Cooper. Nikon D4, Nikon 24-70mm f/2.8 lens. 3 minutes, f/8, ISO 100. Q: When light painting old cars/trucks at night, how do you get the headlights to look like they are on? I have an old tractor in a field that I would like to practice on. — Brien R.
A: We love light painting, especially old cars! Who doesn’t? Light painting the headlights is a tricky but rewarding thing to practice. If the headlights have the glass still intact, use a very low-power light source (e.g., a Maglite or a Coast G5). Stand about 2 to 3 feet from the headlight, but to the side so you aren’t blocking the camera. Shine the flashlight into the headlight briefly—1 to 3 seconds is generally enough. Then walk over to the next headlight and do the same. Here’s a key to this working: Stay invisible. Be careful and use your body to block the light source (i.e., the bulb) from being seen by the camera—we want to capture only the light reflecting from the headlights. I also advise dressing all in black, including black gloves. Sometimes the light bouncing off the headlights can freeze your hand or face in the frame, and you end up being ghosted in the picture. If that is the case, you’ll need to move farther out of the scene and then snoot your flashlight with a long tube— think PVC or a paper towel core. This will give you a more precise paintbrush to place the light. Q: I’m trying to figure out which tripod Lance showed in your CreativeLive class. I went back and watched the class again and figured out that it may be a Manfrotto 190 carbon fiber with a leveling center column. Can you please confirm this? Also, for a tripod this size would you still suggest that setup or has something else come out that you like better? Finally, which ball head would you suggest for this combo? — Marc S.
A: You are correct that I was using the Manfrotto 190 with a leveling head in the video. The head is great, but only for panoramas. It’s unnecessary otherwise. If I were to buy today, I’d go with the Manfrotto 190go! Carbon Fiber M-Series Tripod with MHXP RO-BHQ2 XPRO Ball Head RC2 Kit. I like the twist locks better than the flip locks, which can pinch if you are not careful. However, these days I’m mostly using my Gitzo Series 2 Traveler Carbon Fiber Tripod with Center Ball Head. Arch Rock, Valley of Fire. © 2014 Matt Hill. Nikon D750, Nikon 14-24mm f/2.8 lens at 14mm. 30 seconds, f/2.8, ISO 500. A: Most of the 400-plus National Park Service units are open 24 hours to all visitors—including Natural Bridges National Monument, so I’m not sure why that ranger told you otherwise. 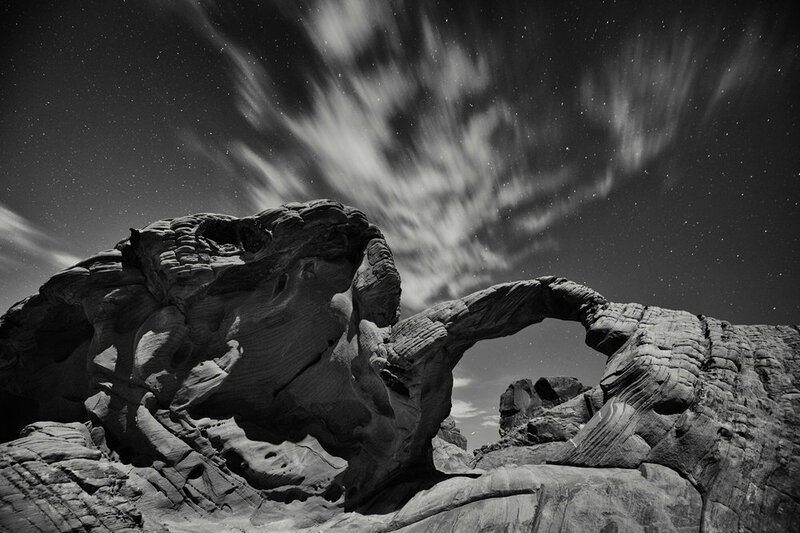 In fact, night skies are part of how Natural Bridges actively entices people to visit. It’s also a feature that Hovenweep plays up, though only some sections of the park are open at night. All of the national parks are open 24 hours per day, except Petrified Forest, but you can get a camping permit to stay overnight, or pay for a Special Use Permit to shoot after hours. Some of the national seashores are closed at night unless you have a camping or special use permit. National wildlife refuges are mostly closed at night, but those are units of U.S. Fish and Wildlife, not the NPS. The Oliver Cabin is one of the many wonderful night photography subjects in Great Smoky Mountains National Parks’ Cades Cove region. Cades Cove is closed to vehicles at night, but you can walk or bike the 11-mile loop road all night if you’d like. © 2017 Chris Nicholson. Nikon D3s, 17-35mm f/2.8 lens, light painted with a Coast HP7R flashlight. 30 seconds, f/5.6, ISO 3200. However, note that even if a park is open at night, there’s a chance that certain features are closed. In addition to Hovenweep, this is also the case at Mesa Verde National Park, which closes access to the ruins after sundown. Another example is Great Smoky Mountains National Park (where we’re hosting a workshop this April): Cades Cove, an amazing place to shoot; it is closed to motor vehicles at night, yet remains open to foot traffic. Aurora over Westfjords, Iceland. © 2012 Lance Keimig. Canon 5D Mark II, Nikon 20mm f/3.5 lens. 15 seconds, f/5.6 ISO 3200. A: Congrats on your Iceland trip! Our No. 1 bit of advice is to get off of the main ring road and explore the random back roads to avoid the crowds. It can be busy over there! As for your lens question, the wider-aperture model will probably be more useful, but it’s always good to have options. If the sky really lights up, you’ll want the widest lens you can get, but the 14mm is crazy wide for general shooting. Also, you don’t necessarily need superfast lenses—with a good aurora, you will probably be stopping down a few stops anyway. Day before full moon, Death Valley National Park. © 2005 Tim Cooper. Canon 1Ds, 16-35mm lens at 31mm. 4 seconds, f/8, ISO 100. Q: We learned from PhotoPills that sunsets can be spectacular when the moonrise and sunset occur within an hour of each other. But the moon rises in the east and the sun sets in the west, so we’re stumped. Any ideas? — Barbara E.
A: I suggesting thinking about it this way: What will be illuminated from the west when you’re facing east, with a great view of the moon rising behind it? The idea isn’t to shoot the sun and moon together, but rather to shoot the full moon rising among beautifully sunlit scenery or among the delicate light of a just-set sun. The other advantage to this scenario is that the brightness of sunset balances well with the moon, which equalizes the intensities to get it all in one shot (as opposed to having to HDR the scene, which is so often the need when trying to shoot the moon over a landscape). For a crispy moon, keep those exposure times short—don’t be afraid to ramp up your ISO to keep things sharp. Ideally, you want a big ol’ moon coming just off the horizon with gentle, ruddy sunlight kissing your subjects. Grab your phone and scout with PhotoPills! Use it to see just where that moon will peek up to be sure you will see it during that sweet spot of sunset with the moon on the horizon.